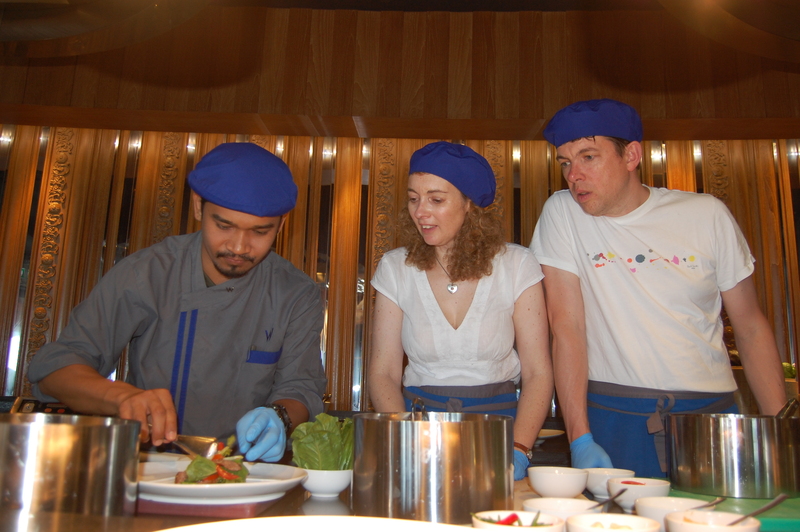 Staying in Thailand we thought it would be the perfect opportunity to learn to make some Thai dishes. W Retreat Hotels Koh Samui offers a two hour cooking experience with the Chef at The Kitchen table. Having multiple food intolerances, gluten, yeast and onion made me assume that a cookery course would be impossible for me. But with the guidance of the Food and Drink Insider, Sea Torres and Chef Pepsi a selection of dishes were suggested that sounded amazing. A chicken and coconut milk soup, chilli beef salad, sweet and sour prawns and a thai green beef curry. I couldn’t wait! 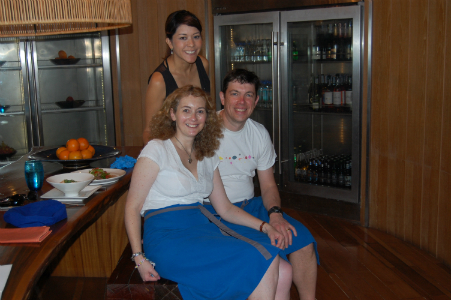 We arrived at 1pm ready to begin our course, we received a warm welcome from Sea and we were introduced to Chef Pepsi. 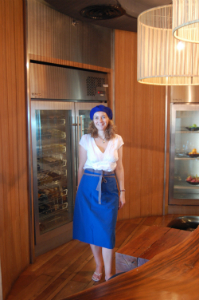 Aprons, hats and blue gloves were provided, we looked ready for action. 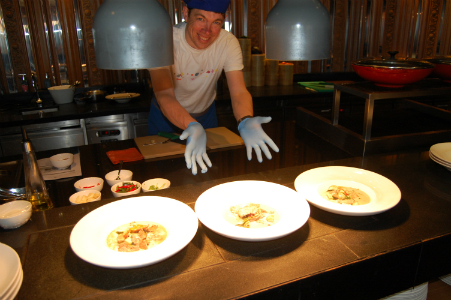 Firstly Chef Pepsi demonstrated the Thai green beef curry. A dish which I used to make before I knew I was intolerant to yeast and onions. To have the chance to learn from Chef to make an equally delicious tasting curry was really exciting. He had put thought into how he could create the dish so that we could both enjoy it. Firstly he used a pestle and mortar to crush fresh lemongrass, green chilli,garlic clove, galangal ( a little like ginger but more peppery ) fresh coriander, cumin seeds, black pepper and shrimp paste ( It is fermented but didn’t seem to cause me any problems ) mashed anchovy fillets, I think would work as an alternative. He heated a deep frying pan and added 2-3 tbsp of vegetable oil. I would suggest using melted coconut oil as it is a much healthier alternative. He added the green curry paste stir briefly to release the fragrance, beef strips were stir fried briefly before adding the coconut milk which was then simmered and bite sized cubes of egg plant and green pepper were added. He also added salt and palm sugar simmered the curry for about 8 minutes. Chef tasted the curry to check if it needed extra salt or sugar. We tasted the curry too, it was delicious. I couldn’t wait to make my own! 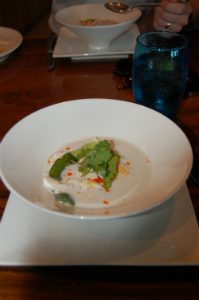 He served the thai curry in a bowl and garnished with fresh basil and slices of red chilli. Then it was our turn, we chose to have individual pans Mr S loves a competition . We were both very proud of our finished Thai green beef curry. 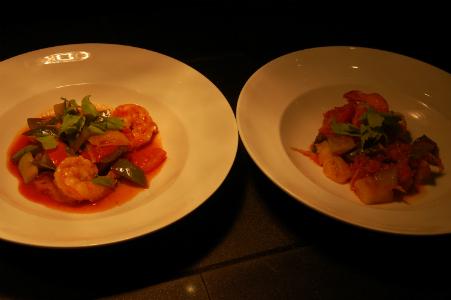 Chef Pepsi also demonstrated the soup, salad and sweet and sour prawns. We thoroughly enjoyed having a go at each of the dishes. Mr S’s sweet and sour prawns was a triumph. Unfortunately a yeast free version of this dish is tricky so my version left a little to be desired. I could not add the ketchup or sweet chilli sauce sadly which left me with tomato puree and lime juice. This dish still needs some work! Mine is the bowl on the right sadly. 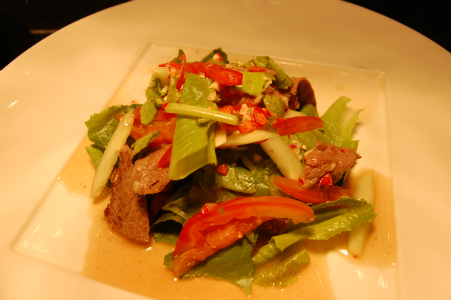 The beef salad was nice and simple to make, as was the chicken, mushroom and coconut milk soup. I just had to leave out the mushrooms. The salad was delicious but very spicy so we were thankful for the soup. After making the dishes we sat down to eat our lovely Thai meal. A very interesting and fun couple of hours. We both look forward to recreating the dishes back in the UK. 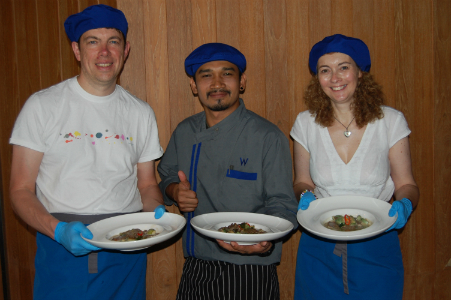 A big thank you to Pepsi for taking on the challenge of ‘free from’ Thai cooking. I think we all learnt something new that afternoon! If you are visiting W Retreat Hotels in Koh Samui and have food intolerances you can feel confident that Chef Pepsi and Sea will work with you to make your holiday dining experience a stress free one. Maybe you will challenge Chef Pepsi to come up with some more ‘free from’ dishes? Taking part in the cookery lesson is a good way to get to know the Chefs you learn new dishes and they in turn learn more about your food intolerances, which will help during the rest of your stay. For example. today for lunch Pepsi kindly made me a gluten free, onion free, yeast free Pad Thai a new experience for him! an amazing treat for me. Definitely worth emailing the hotel before you arrived to inform them of your dietary needs.